Weeds are nasty little thieves. They will take your nutrients, crowd out your vegetables, and then spread their seeds so as to come back the next year. They arrive on your pet’s fur, in bird droppings, hitch rides in your compost and the soles of your shoes and blow in on the wind. Even the most pristine soil will not stay that way long during the warmer months. Chances are this summer’s rainy weather hasn’t inspired you to go out and weed. We are all in the same boat. (And if you aren’t in the boat, you are likely drowning.) Summer weed control begins at the end of winter. Timing is pretty important. I plant oats and crimson clover on my vegetable garden to overwinter, that is, the parts that aren’t in winter crops. But even with a cover crop, weeds sneak in. Early in the spring you can safely till in your green manure crops and the weeds. Removing weeds from winter soil is a fool’s game. You’ll never get all the roots from soil that has been packed hard by frost and winter rains. Many books and back fence sages will warn you never to till in perennial weeds because the pieces all come back as new plants. That is true, but so what? Once the soil is tilled and warmed by the sun, weeds are much more likely to come out roots and all. So even if there are more pieces to pull, your chances of removing the weed permanently is enhanced. Plan to till a second time after the garden gets a nice mild week of sun that will sprout the weed seeds you churn up. Then run out there and kill them all with a second tilling. Summer weeding is a whole different kettle of fish. Sunbaked soil is even more difficult to extract weed roots from than hard winter soil, so I have consulted the experts. Victoria gardening author Carolyn Herriot (The Zero Mile Diet) recommends pulling weeds on sunny days after rain or heavy watering, which softens the soil. Then leave their little corpses on the paths to rot. She also uses weeds to diagnose imbalanced soil conditions. Dandelions may indicate a lack of essential minerals. Clovers and vetches suggest nitrogen deficiency. Oregon-based writer Steve Solomon (Growing Vegetables West of the Cascades) spends a few minutes each week with a sharpened hoe, cutting weeds in half at the soil line. I myself have a pointy Dutch hoe that I sharpened using a power drill and a grinding bit. Solomon’s method works well on weeds that set seed if you get them early and to control new weeds in a garden that is already mostly weed-free. Some invasive weeds and most grasses can’t be adequately controlled with a hoe. You’ll have to remove them entirely. Here’s what I do. Wait for Herriot’s aforementioned sunny day and water thoroughly in the morning. Take a garden trowel and stick it straight down into the soil about three inches from the stalk of the weed. Push the handle away from the plant to lift it gently, then pull it carefully from the soil and shake the dirt off the roots. Invasive species should be left to dry in the sun before composting. 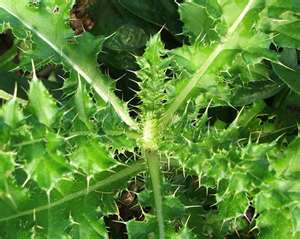 New weeds that sprout inbetween weedings can be cut up with the hoe, greatly extending the period between handsand-knees weeding sessions.